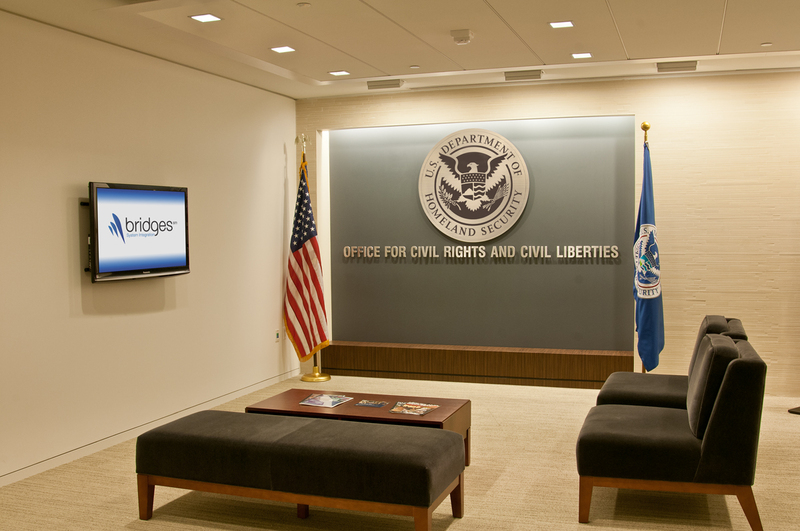 The Department of Homeland Security, Office for Civil Rights and Civil Liberties (CRCL), tasked the Bridges SI team for the new construction of their divisible conference spaces. This included close work and coordination with Chief Administrative Office (CAO), the general contractor, and the architect. The facility featured three spaces with two air walls, encompassing divisible but connected systems that had the ability to operate independently or combined as one. 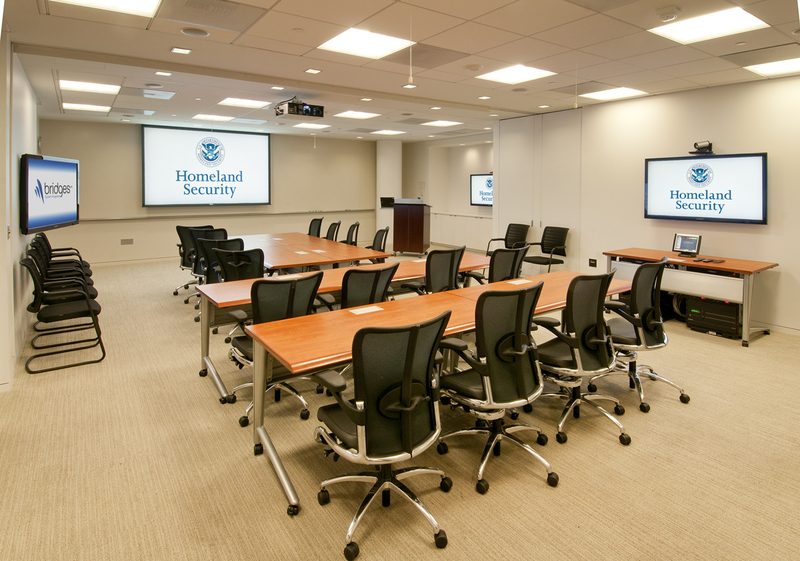 CRCL had a requirement for a scalable AV system and environment with spatial flexibility and multiple configurations that could support their various day-to-day activities as well as accommodate national training events and department all-hands meetings. Our interior design group provided aesthetic enhancements to the space that included recessed connectivity pockets installed throughout the area. 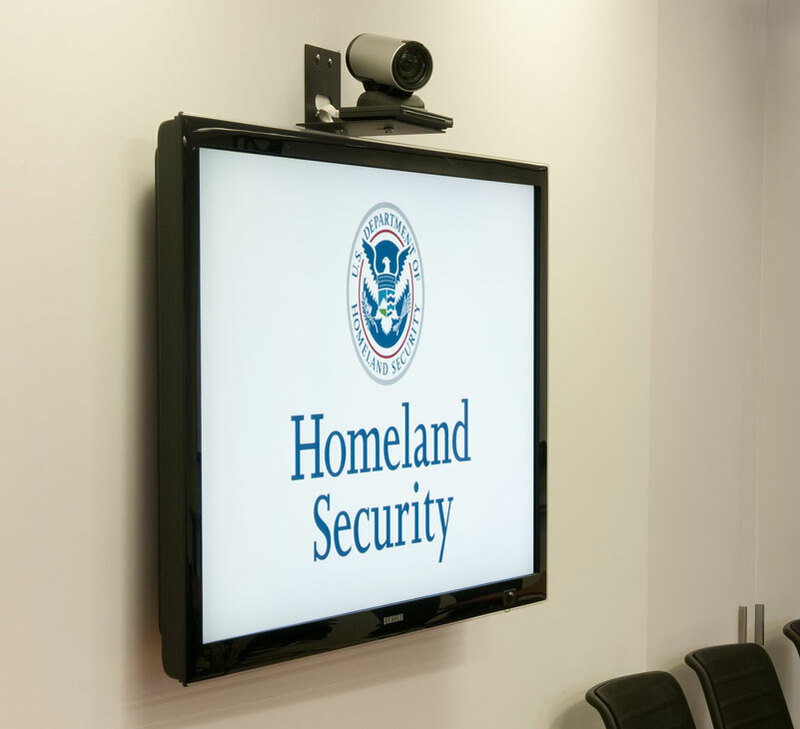 In addition, the team worked to incorporate agency branding into the near-side backdrop during Video Teleconference (VTC) calls. This effect is to used to minimize distractions and help promote the “One Voice” vision. Our systems engineering and integration teams played the lead role for this project. The system was designed to accommodate the divisible floor layout by including a variety of connectivity interfaces throughout the area. From wall plates to floor boxes, users are able to conveniently connect their AV peripheral devices (guest laptops, etc.) into the system for display and playback. The entire system is comprised of a centralized, digital switching and distribution core that offers the scalable feature set required for their operations. 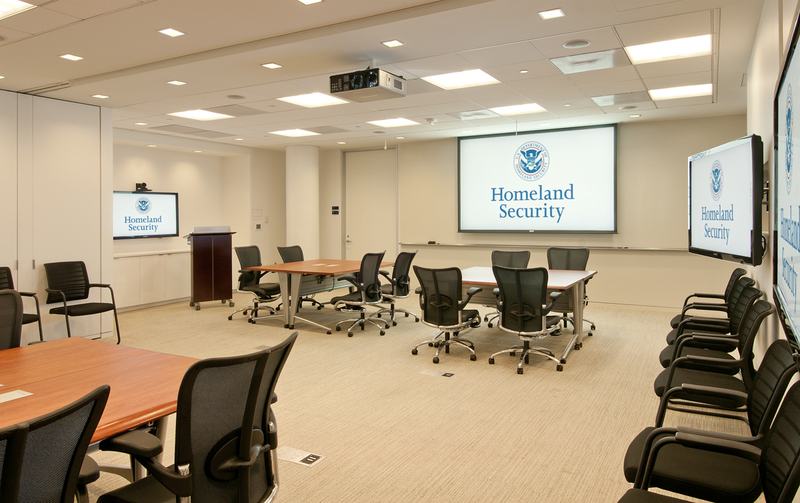 Two of the spaces include a High Definition (HD) projection system and supplementary HD displays mounted along the side walls. 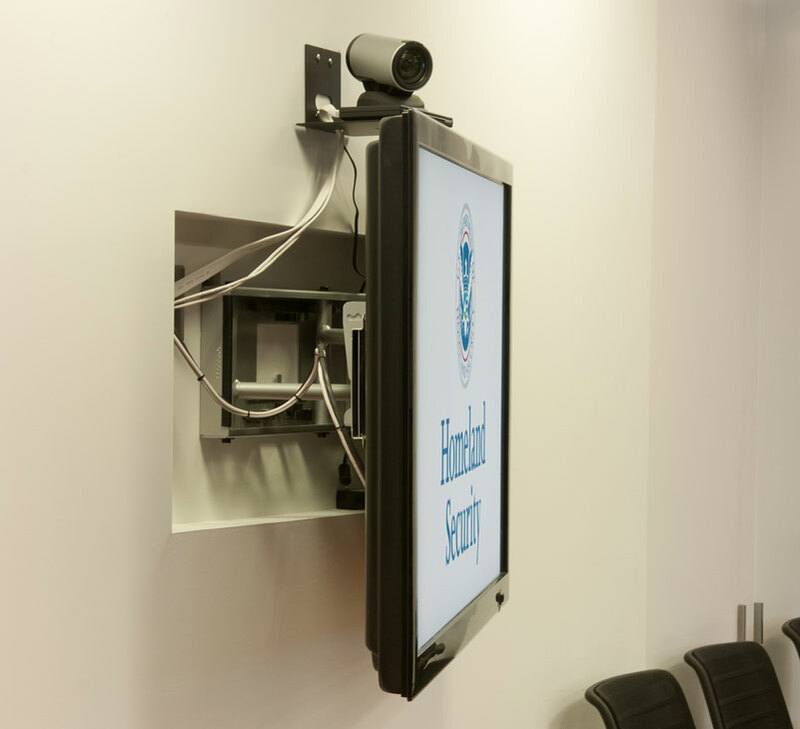 The display systems are all connected to the central switching system, allowing any connected video source to be routed for display on all or any of the display systems. 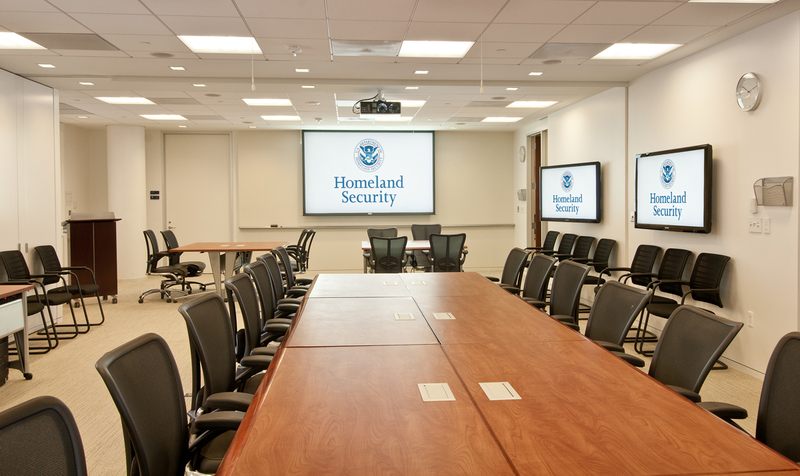 Integrated VTC capabilities allow each of the spaces to conduct voice, video, and data calls independently and simultaneously. All of the spaces support internal voice reinforcement for presenters at the lecterns as well as mobile presenters. Users have the choice between wireless handheld, lavaliere or body pack microphone systems, allowing flexibility and comfort for ease of presentation. Users are able to control system functionality of each individual room from a dedicated touch panel included with each space. Further, when the spaces are combined, one of the touch panels automatically becomes the “master” controller and is able to control functionality over whichever rooms are combined. An occupancy sensor is connected to the control system, which has been programmed to enable or restrict connected functionality, depending on the wall configuration. 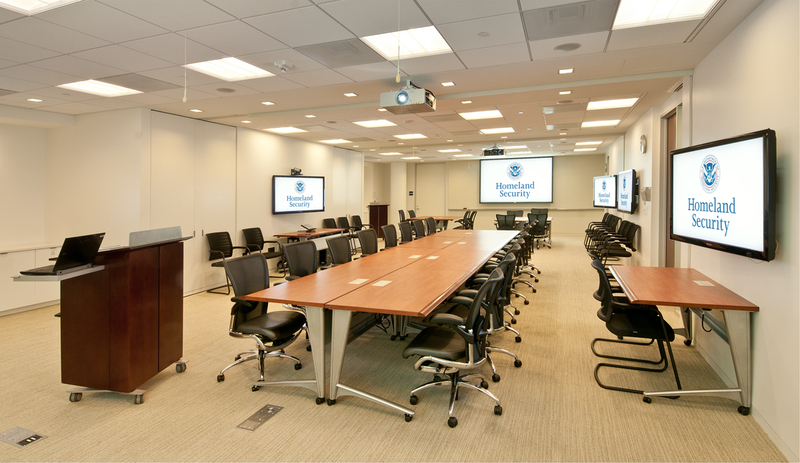 The divisible conference room AV system is setup to provide ease of access for hardware servicing and firmware/upgrade support. Currently, Bridges SI provides complete service and maintenance of all applicable AV system components and functionality. This includes regular, quarterly preventive maintenance visits as well as ad-hoc and remedial coverage through our web-based support portal.